"Hey! I lost the money seems like I can't comprehend it. Yeah! Got a hole in my head gotta gotta mend it. Too messed up to sit and settle down. Too messed up to even mess around. That's why you're smiling Mr. CEO." I remember seeing an interview with The Clash once, and band members Joe Strummer and Mick Jones were lamenting that by the time they started the band in the late 1970s "punk" had already come and gone. Whenever it started or whenever it died, the word has become synonymous for prickly, non-mainstream rock and roll, though in recent years there has been a decidedly more commercial approach to most of what is considered alternative music. MVD has a healthy catalog of left-of-center DVD titles featuring an array of underground talent, from the poop-slinging GG Allin to poet rock icon Patti Smith. 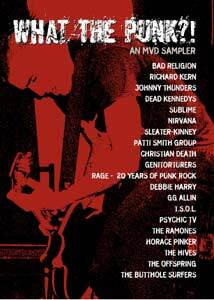 This latest offering is a sampler of their assorted DVD releases, and consists of 21 clips of groups who signify different eras of the so-called punk movement. Each group has their own related DVD under the MVD banner, with the idea being if you like what you see on the sampler, then you'll hopefully buy the corresponding full-length disc. There isn't any real rhyme or reason to this collection, as best as I can tell, though that's not really a negative; the clips simply move from one to the next, without much fanfare or thematic connection. The content is generally a mixture of live performances (Johnny Thunders, T.S.O.L.) and music videos (The Hives, Horace Pinker), with one (Nirvana) actually nothing more than fan interview excerpts. The only real disappointment is the rough (re: consistently poor) video and sound quality, which while befitting the "punk" spirit, only made me wish all the more that rock gems like Sleater-Kinney's Words and Guitar had the benefit of a cleaner audio track and sharper image. Image Transfer Review: Presented in 1.33:1 fullframe, image quality is generally fairly ugly. Most of the clips have a rough, amateur look to them, and the content here is miles away from those slick big-budget music videos MTV weaned us on. The look fits the spirit of the music, but it ain't always pretty. Colors look largely washed out on most of the clips, though The Hives Hammer Films-inspired video looks excellent. Audio Transfer Review: The backcover states the music is in stereo, but the bulk of the segments were seemingly recorded in mono. The music videos for Horace Pinker, The Hives, Patti Smith Group sound the best of the bunch, with most of the other live recordings coming across noticeably flat. Extras Review: The disc is split into 21 chapters, one per song. The menu provides a brief text blurb about the corresponding DVD, with the option to proceed directly to the video clip. No subtitles or trailers of any kind are included. A retail price of well under $10 will make this a tempting purchase for fans of hard-edged alternative music. The quality of the content is inconsistent (strictly in terms of video and audio quality), but simple pleasures like The Hives driving Die, All Right video or vintage Johnny Thunders tripping through a live version of Born to Lose make it all worth it.